In the spindly villages of the Italian Riviera, like Vernazza, the march of time has a strong beat. Everyone knows everyone. Even repeat visitors, like me, celebrate births, see people grow old, and are saddened by their loss. For years, Lorenzo dazzled me with the fine yet rustic cuisine of Liguria — addictive anchovies, fresh pesto ground from basil picked today and sprightly white wine. Then one year I came and Lorenzo was gone — a victim of cancer. Now, he's king of the mountain in nearby Manarola. He's resting and enjoying the best view of all from a "hotel" booked out by locals for years: the town's hilltop cemetery. I remember the day I learned of Lorenzo's death. Leaving Vernazza's harborfront, I climbed the long, crooked staircase up to Il Castello, Lorenzo's restaurant, where Monica, his 30-something daughter, greeted me warmly while giving me the sad news. 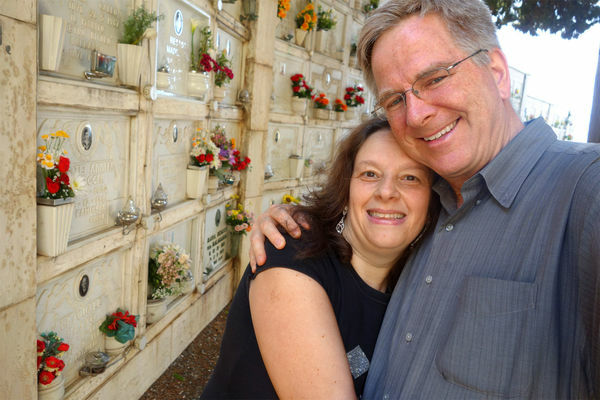 On a later visit, when I told Monica that I'd been thinking about her father she suggested we visit the cemetery. Hiking through narrow back alleys that smelled of damp cats, we found the lane that leads uphill to the cemetery. I could recall, after a funeral Mass, seeing the entire village spilling out of the church and parading darkly up this same route. At the top, an open black iron gate welcomed us into the cemetery — fragrant with fresh flowers. Quiet lanes separate marble walls of niches, stacked five high. Walking down a lane closest to the sea, Monica explained that coffins are not put into the ground but slid into a loculo. Squinting at a wall of niches, reflecting bright white in the late afternoon sun, I reviewed names and dates carved into the marble. Each niche is wired with a tiny light and comes with a built-in vase. And next to each vase is an inset oval window filled with a portrait. Ever since the early 1800s, when it was decreed that cemeteries were health risks, the burial spots of Riviera towns have been located outside of town. The result? The dearly departed generally get first-class sea views. 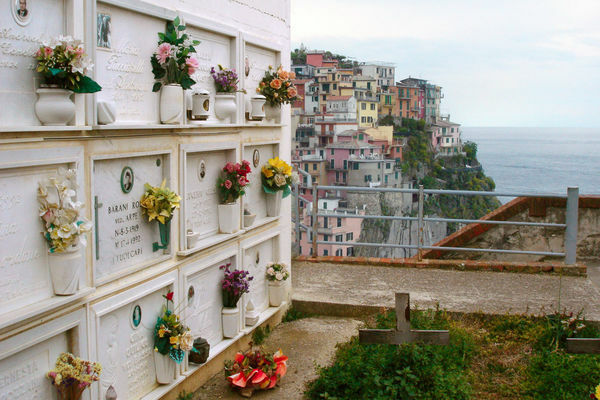 Each village cemetery — with evocative yellowed photos and finely carved Carrara marble memorial reliefs — is worth a visit. Stepping around a rolling ladder — left out for loved ones who come with flowers for those resting on the top row — Monica arrived at her father's loculo. She left me long enough to cross herself. Then, turning toward the sea, Monica sat on a flat rock just big enough for two. Patting the other half of her perch, she invited me to sit down. We ignored the red tiles, flapping laundry, and tourists lounging on the breakwater below and enjoyed the sweeping cemetery view. After swapping stories of how Lorenzo loved to feed hungry tourists, I assured Monica that her father would be happy at the way she carries on the family tradition. Then I asked my friend about traditional funerals in this part of Italy. Monica told me, "When someone dies, the body is dressed up and lies in bed for two days as everyone in the village comes by. The house must be open all night. The law requires this for 24 hours — 48 hours in the case of a heart problem to be sure the person is really dead. It can be a hardship on the family. Such a sad time. But it is a time when a community is strong together." Smiling, she explains how some families avoid the mass of visitors. "When someone is about to die, they'll call the ambulance so the person can go to the hospital and die there. This way you don't have the village in your house." "This is the village tradition. In the big cities, things are different. My professor died in the hospital — we were sent away at eight o'clock at night. He was behind glass." I asked if all funerals were Catholic. Monica recalled, "Recently a strong communist who was dying asked for a civil funeral. He insisted, 'No priests.' This is rare and courageous in front of death. It may be OK to have a civil wedding, but death...it is the finish." From our perch, the world was a peaceful green and reassuring blue that blends the sea and sky. 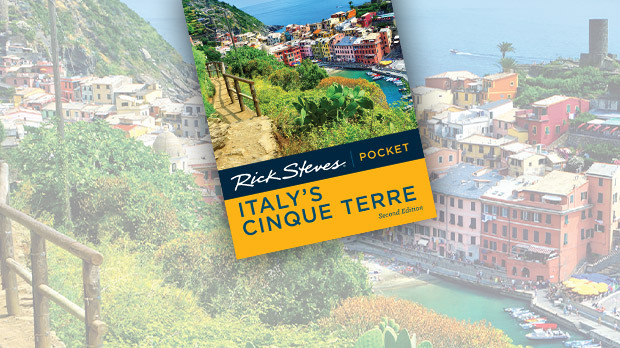 To the left and right, I could pick out each of the Cinque Terre towns along the coast. Each is alone in the world — seemingly oblivious to the march of time. I wondered what could possibly make this moment more evocative. Then the church bells rang.